It's tough trying to trick kids into eating vegetables. Namco Bandai helps out—and cashes in on the Wii's target audience—with The Munchables, a game where you eat what's bad to do good. At the start of the game, Don Onion and his brigade of space pirates take over a planet on which live two of the cutest Pokemon rejects I've ever seen. Munchie and his (her?) pal Chomper set out to defeat the forces of evil vegetable by eating everything in sight. This is pretty much all the plot you need to understand where The Munchables is going – but read on for a full breakdown. The Munchables is a single-player puzzle/platformer game where players take the role of either Munchie or Chomper. There are eight stages in the game and to progress, the player has to consume as many enemy food items as possible to gain levels and thereby open doors. I played through the Dessert Factory stage as Chomper. The game is due out May 26, but it looks a little buggy in terms of graphics and animations. For example, there was a one point, Chomper entered a chocolate-coating machine and activated a cut scene. For no explicable reason, Munchie come out of the machine, participated in the cut scene and then was replaced by Chomper when the game resumed. Full Blown Co-op Please: Currently, the control scheme only allows the second player to provide targeting support (think Mario Galaxy). With such cute (and customizable) characters as Munchie and Chomper, it'd be a cute-splosion if you could somehow have them both on screen and playable. Is That a Bomb or a Pirate? : The screen is very busy in The Munchables, sometimes making it hard to tell if the things coming toward you rapidly are enemies to be nommed on or bombs that will shrink you temporarily. Part of the problem comes from the sheer amount of enemies that can be on screen at one time, but a bigger part of it may be the character's level displayed over its head in bright, flashing text – very distracting. Grapes Aren't Vegetables: Unless there's a cut scene explaining that all fruit on the planet defected to Don Onion's side, I don't think it's fair to have to fight grapes as part of his sinister army. Even if you're going to tell me that all fruits are vegetables at heart in real life, I'd still like a cut scene explaining – especially if I'm a kid that's been indoctrinated with the food pyramid. Unbearably Cute: It's the Wii, it needs cute. It thrives on it. Simple Controls: The analog stick on the Nunchuck does most of the moving moving, a simple flick of the Wiimote does the jumping, the A does the eating and you can attack enemies and break them into smaller bits by pressing B. These basic controls minimize the amount of flailing you have to do in the game and are kid-appropriate. 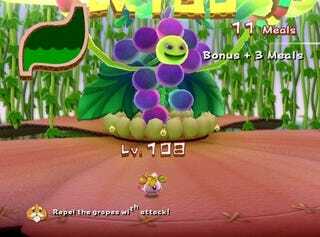 Replayability: The game features three different play modes (time attack, reverse and regular mode), plus a secret unlockable character you can earn by completing the game as Munchie or Chomper. As kids games go, this looks like a pretty good one. I'm not sure if it will get them eating vegetables right away, but it will definitely keep their attention for a good long while.